Holden cat converter, Jaguar muffler and Ferrari exhaust butterfly! 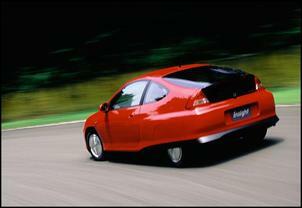 This series is based around a 2001 model hybrid Honda Insight. The Insight remains one of the most aerodynamic and lightest cars ever made, with a Cd of 0.25 and a total mass of about 850kg from its 2-seater aluminium body. The intent of the project is to turbocharge the engine, add water/air intercooling and programmable engine management, and then provide new high voltage batteries and a new electric motor control system. The aim is to build a car with the best performance/economy compromise of any in the world. The rationale for the exhaust design was pretty simple - excellent flow with adequate noise suppression. But like nearly all things to do with this project, there were subtleties and other factors that made it more interesting than most off-the-shelf modifications. 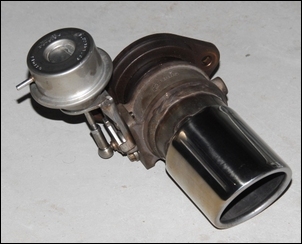 A 2-inch exhaust, made from mandrel bends and using an appropriately flowing cat converter and muffler, has a cross-sectional area double the standard exhaust – and so should flow absolutely heaps for the power being developed. The use of 2 inch piping had two further advantages. Firstly, the 2-inch pipe could still be fitted under the car within the original exhaust recess. (The bottom of the Honda is largely flat for aerodynamic reasons, so taking another route with the pipe wouldn’t be a good idea). Secondly, I had available a muffler, cat converter and exhaust butterfly that would work with this size pipe. 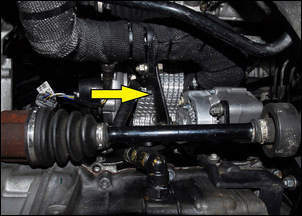 Off the turbo, the exhaust pipe takes a long 90-degree (ovalised) bend as it squeezes past the alternator; this is then followed by two 90-degree bends before the pipe exits under the car, parallel with the floor pan and facing backwards. A stainless steel flex section is installed at this point, catering for the transverse engine’s movement under load. The cat converter immediately follows the flex section, after which there is about a metre of straight pipe that then connects to three 45-degree bends that take the gases under the rear torsion beam axle to the muffler, located just prior to the back of the car. 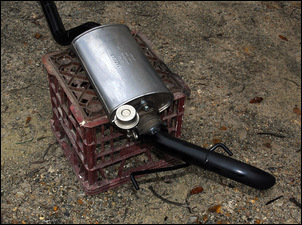 Bolted to the rear of the muffler is a variable flow control valve that connects in turn to a short tail pipe exiting at the factory location of a hole in the lower bumper cover. 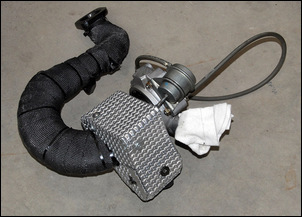 Not being easily available from commercial sources, the exhaust flange for the turbo dump was made from scratch. It was rough-cut from 8mm plate using an oxy acetylene and then ground, filed and drilled to the correct profile. The dump pipe off the turbo was built no less than four times. The difficulty was in squeezing past the alternator while still clearing the steering arm. The steering arm is at its most difficult position at full suspension droop and with full right-hand steering lock. The first version of the dump used a normal 180-degree, 2-inch mandrel exhaust bend off the flange. This was neat, cheap and simple. However, it turned out that it didn’t give the required clearances. The next version mixed a steam pipe (ie heavy wall) 90-degree bend off the turbo with normal exhaust pipe bends after that. However, the exhaust pipe needed to be shaped into a rectangular cross-section to get past the steering arm and alternator; this in turn reduced internal cross-sectional area at that point. The next version used larger diameter steam pipe bends cut, welded and shaped to give the required clearance. However, the greater wall thickness meant that the internal cross-sectional area became too small. The final version uses a 2.5 inch, 180 degree mandrel bend. This bend was ovalised in my press, being first filled with sand to help it hold its shape. The use of a larger diameter tube maintains cross-sectional area, even when it is flattened as was required to clear the steering tie rod and alternator. At the end of the ovalised bend, the exhaust transitions to 2 inch pipe via short fabricated cone. It then passes through two 90-degree bends before this section of the exhaust ends in two-bolt flange. 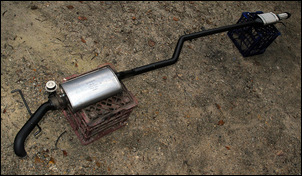 The use of the flange allows the exhaust to be easily removed from the car in two pieces. 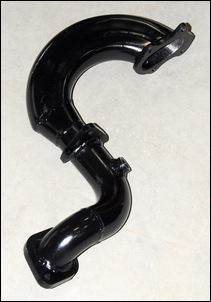 A strong brace (arrowed) connects the exhaust after the turbo to the alternator mount; this brace is used to reduce the loads occurring on the three 8mm studs that hold the turbo exhaust manifold to the head. In effect, the turbo is supported by three head studs, plus the four mounting bolts of the alternator bracket. The wide-band oxygen sensor is also mounted on this section of pipe. This first section of exhaust is lagged. 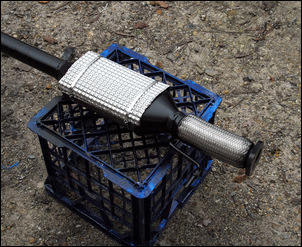 This gives faster light-up of the cat and also protects close-mounted engine bay components from heat. 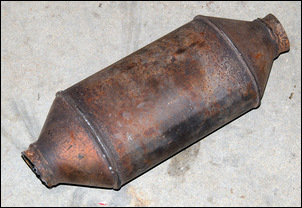 The majority of the exhaust length was made up of pre-formed mandrel bends. In the past, mandrel bends have cost a proverbial arm and leg but these days, through the joys of eBay, they’re quite cheap. The exhaust used eight mild steel mandrel bends at a typical cost of AUD$11 each. The cat converter is a stainless steel unit from a Holden Commodore V8, bought second-hand from a low kilometre car for nearly nothing. The car originally used two of these cats, so each is sized to flow well over 100kW. A heat shield was fitted to the upper part of the cat that is relatively near the underbody. The heatshield is held in place with stainless steel cable ties. 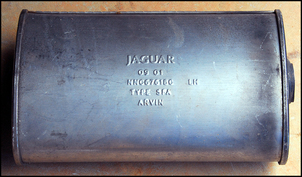 The muffler – just a single one is used – is a resonator from a supercharged Jaguar XJR100. A friend gave a pair of these to me a few years ago; again, they’re made of stainless steel. Despite being a straight-through design, they suppress noise very well. The tricky part of the exhaust is the rear-mounted butterfly. This was sourced from a Ferrari 575M - in that car, these butterflies are used to vary the flow from the second outlet of each of two mufflers. In the Honda, the butterfly is placed so that all exhaust flow has to pass through it. As we have described previously (for example, see Pure Pipe Perfection 2 - Introducing the Secret Weapon...), as exhaust backpressure rises, noise reduces. In addition, as backpressure rises, the cat converter comes up to operating temp more rapidly. The exhaust was MIG welded together. It was built with the car placed only on jack-stands (rather than a hoist) – at times uncomfortable, but still quite possible while working at home. The exhaust was relatively low in cost, should flow extremely well, and with the use of the variable butterfly, can be tuned to provide whatever combination of flow and noise level is required at different loads.